International researches have shown that the Cretan Diet offers people good health and long life. It is based more on the consumption of olive oil, vegetables, wild greens, pulses and cereals and less on the consumption of meat. Nevertheless, this does not mean that it is lacking in taste. Cretan dishes send forth fine flavours and tastes which can still be felt in the villages of the island. It should be noted that although in past years the Cretans ate meat once a week (or even more rarely) and fish a little more often, they knew how to prepare those products in many different ways, usually combined with vegetables or pulses. Likewise, Cretans have numerous recipes for the preparation of snails, one of their most favourite dishes. In this book you can find the main recipes which have been preserved on Crete for centuries and which, together with their way of life, constitute what is called today “the miracle of the Cretan diet”. This is THE Cretan cookbook!! This is THE Cretan cookbook!! Loaded with great authentic Cretan recipes and beautiful photos and information about Crete and Cretan cooking - the healthiest cooking/diet in the world! I bought my original copy on Crete and was happy to find it on amazon to purchase for a gift. I also highly recommend "The Omega Diet - the lifesaving nutritional program based on the diet of the island of Crete" by Artemis P. Simopoulos, MD. 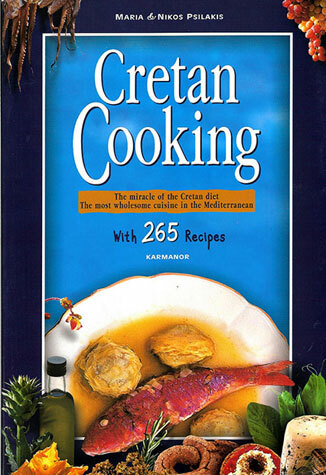 Additionally, if you are interested in eating an AUTHENTIC Cretan diet - which is THE most truely perfect "Mediterranean diet", there is no better cookbook than "Cretan Cooking". My only recommendation to you is that you buy a scale that measures in grams/kilo's - all measurements for flour are in metric in this cookbook since it was published for the european market.